Huge thunderstorms jarred us awake at 5am, then the day went dark with steady hard rain all day--the first of several days of temperatures in the 40s and 50s, constant gray skies, and plenty of WET. We only ventured as far as Pontivy, the other medium-sized town nearby to the west of Rohan. We had a nice omelette lunch at the Cafe Rivoli sitting at a table open to the sidewalk, but awning leaks and wind made it colder and damper than one would ever wish for al fresco dining. 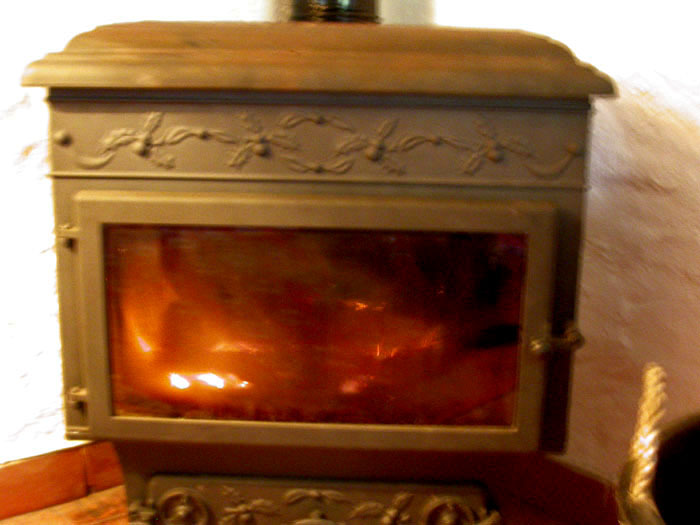 Back at the gite I made a roaring fire in the wood-burning stove, and we resigned ourselves to July Brittany-style. The gite has a very nice swimming pool, but neither of us ever went in during our visit. Plenty of cold swimming is available in Maine, and it seemed odd to even consider the heated-pool option, given the rain and air temperature. We were also discovering that we had brought altogether too many short-sleeved shirts and pairs of shorts, when sweaters and windbreakers would have been more appropriate. F saved the day with a superb steak with wine and shallots dinner. We watched the wind try to uproot the adjoining vegetation and turned up the Bill Evans CD after candlelight dinner.